What Are Carbon Electrodes Used For? You are here: Home > News > What Are Carbon Electrodes Used For? The carbon electrode is composed of anthracite and metallurgical coke to be the main raw material (sometimes with a small amount of natural graphite or graphitization broken) produced conductive material.The specific resistance of carbon electrode is 2~3 times greater than that of graphitized electrode. The compressive strength of carbon electrode under normal temperature is greater than that of graphitized electrode. 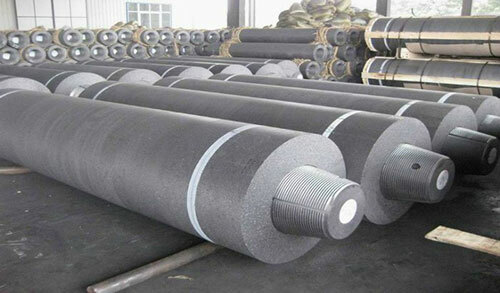 As the main raw materials are anthracite and metallurgical coke, the carbon electrode is generally 6-10% ash. The carbon electrode is suitable for the smelting of some common electric steel and ferro-alloy in medium and small electric furnaces and ferro-alloy furnaces. Because of the high ash content of carbon electrode, it is not suitable for smelting high-grade alloy steel. The raw material of carbon electrode is easy to be solved. It does not need to be graphitized in production. The cost of the product is much lower than that of graphitized electrode. The products are machined after being roasted. Machining includes the threaded joint holes for the finish surface and the end of the joint, as well as the joint for the connection of the two products. In order to make the two electrodes better connected, several kilograms of carbon paste made of graphite powder, syrup and water should be supplied for each ton of finished products to be coated in the joint hole.